In anticipation of an announcement from Education Secretary Betsy DeVos, ‘Violated’ has a comprehensive look at what role colleges and universities have in addressing complaints of sexual violence. Hear the voices of women who talk about the impact of being denied academic, counseling and safety services on campus – all aspects that Title IX enables and currently requires colleges and universities to address. Here are a few excerpts from ‘Violated,’ including a passage from former U.S. Department of Education Office for Civil Rights head Catherine Lhamon, now the chairwoman of the United States Commission on Civil Rights. “We share the authors’ view that student sexual violence is a complex and important problem that defies simple solutions. We are deeply sorry for anyone connected with the Baylor community who has been harmed by sexual violence. 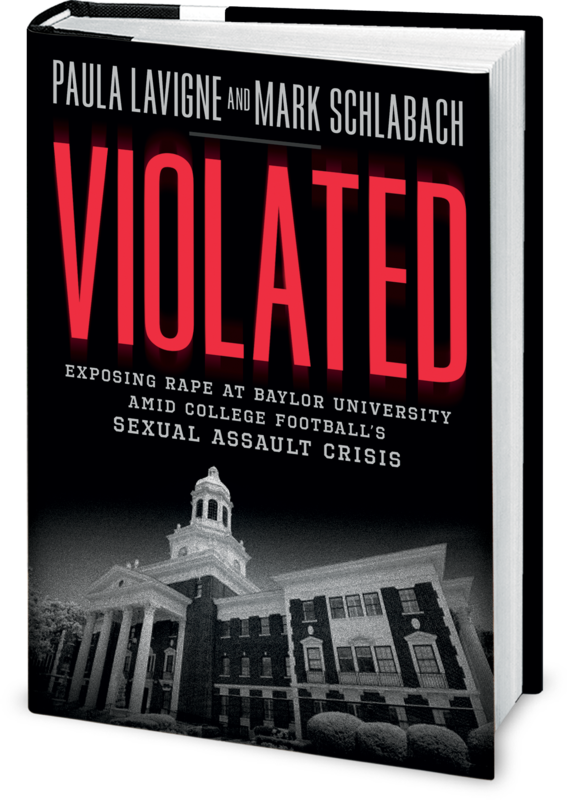 Paula Lavigne and Mark Schlabach will appear at two Texas bookstores to promote their upcoming book, “Violated,” which will be released by Center Street on Tuesday, August 22. The authors will appear at the Books-A-Million at Grapevine Mills in Grapevine, Texas from 2 p.m. CT to 4 p.m. CT on Saturday, August 26. More information about the BAM location can be found here. The authors will appear at Brazos Bookstore, the premier independent bookstore in Houston, at 5 p.m. CT on Sunday, August 27. Houston Chronicle columnist Jenny Dial Creech, past president of the Association for Women in Sports Media, will moderate the event, which will include a Q&A with attendees. More information about Brazos Bookstore can be found here. Baylor trustees told “Violated” authors Paula Lavigne and Mark Schlabach that they were unaware the university’s athletics department didn’t have a drug testing program in place for student-athletes, which made it one of the few FBS programs in the country without one. The trustees acknowledge in the upcoming book that they didn’t find out about the lack of a drug testing program until it was discovered during Philadelphia law firm Pepper Hamilton’s investigation into how the university handled allegations of sexual assault. You can learn more about it here and here.